This post is a continuation from my last post on Debt and the Future state of the Global Economy. That post outlined using hard numbers the very grave danger were in. This post will outline strategies on how to prepare for what is likely to come based on a model of deflation. Central Banks are printing money as if there is no tomorrow. The Fed is injecting cash into the US economy to the tune of hundreds of billions and the European Central Bank (ECB) to the tune of a trillion dollars. With all this extra money being printed people are fearing massive inflation if not hyperinflation. Gold sellers are having a hay day with all this fear and paranoia. However perhaps that fear is misplaced. The way inflation used to occur…for the last 30+ years or so, is that the central banks would lower interest rates at the central bank. What this did, is it allowed people to take on more debt easily. People took advantage of falling interest rates and INFLATED their personal money supply with excess credit. This caused gross monetary inflation in the greater economy. Wages have stayed flat since the early 1970’s so the extra money people have didn’t come from there it came from debt. This was a way that central banks could artificially prop up and boost the economy/GDP. Make more money available via easy debt. However now Interest rates at the Central bank are near 0%. Central banks CAN NOT make the accumulation of debt any easier. And thus people can’t inflate their personal bank accounts with more debt, and thus inflation will basically stall. In fact as economic turmoil hits, and unemployment rises, and bankruptcies increase there will be DEFLATION…not inflation. The ONLY way for inflation to occur with interest rates near 0%, is IF the Central Bank prints money and sends it to you in the mail! Until that happens, deflation is pretty much a guarantee. Monetary Inflation – Interest rates drop, people take on more debt, the total sum of money people have to spend increases. As more spending power is available business jack up prices on goods since the can make more profit and people are willing to pay. Actual Cost of Goods Inflation – Sometimes the price of goods goes up irrespective about how much money people have. Fuel prices might rise, resources diminish making them more expensive, droughts, wars, etc. can all make the price of goods go up causing inflation to rise. Scenario 1 was the core reason why inflation occurred over the last 40 years+. Scenario 2 is the way inflation occurs now and will occur over the next 10+ years. Thus you can truly have a rising inflation rate alongside a deflationary economy in a recessionary environment. Cost of goods rise while the amount of money people have continues to fall. In fact Central Banks around the world have dug themselves a hole so deep they can’t get out. If they were to raise interest rates it would hurt more people than it helps, and sink the economy even further. Thus they are stuck at near 0% for the foreseeable future. This will ensure that deflation will continue to exact its toll on the economy, and central banks are powerless to stop it. In the money supply statistics, central bank money is MB while the commercial bank money is divided up into the M1-M3 components. “This causal chain is contentious, however: some heterodox economists argue that the money supply is endogenous (determined by the workings of the economy, not by the central bank) and that the sources of inflation must be found in the distributional structure of the economy. This graph shows that printing huge amounts of money has no correlative effect on M3 supply, aka. total currency in circulation. 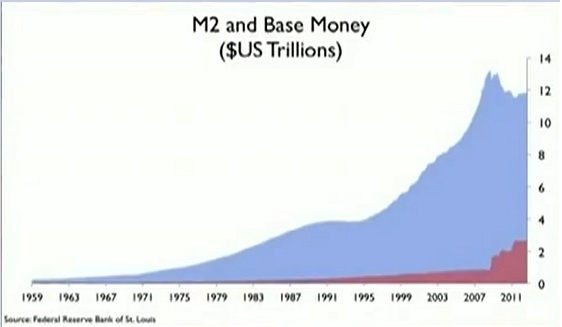 Another graph showing how M2 is decreasing…while base money factored into M2 is increasing. That base money is the Fed doing QE stimulus which is ending up in a liquidity trap. 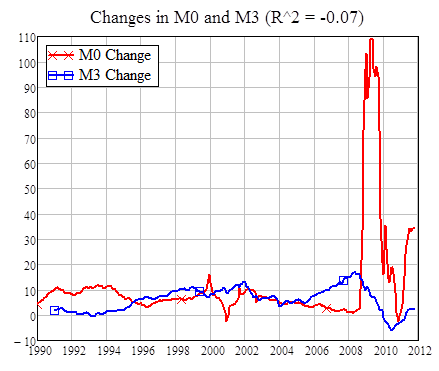 The real decrease in M2- base money shows deflation on a scale, not seen since the great depression. The above graph couldn’t show it any more clearly. The fed is printing money like mad, which theoretically should cause inflation, yet deflation is winning as losses from the housing crises are slowly being realized. Professor Steve Keensee’s massive deflation ahead. Back in the great depression in the initial years deflation was at times 10% as a massive amount of de-leveraging occurred. inflation has no correlation to actual money printing, 90% of the money in a currency is NOT printed but loaned into existence, so that alone is a good reason why massive deflation will occur instead of inflation. That money is brought into existence by the banks and will go out of existence there. This completely changes the strategy to hedge against crises. It would seem it would be best to hold money in a currency that stands to deflate as that currency will be worth more, and buy more stuff. Central banks can print trillions of dollars, and give it to its naiotnal banks to hold in their reserves. However this money dosent enter the economy until the banks loan it out, and most people are already in so much debt they cant afford to take out more loans. Thus all the money the central banks just printed, sits there in vaults, and does nothing. The only other option I see is the central bank gives it to the government that pays it’s debts with the printed money. This would definitely cause inflation. Also the government could start mailing people money. The Age of Deleveraging: Investment strategies for a decade of slow growth and deflation, published in late 2010 by John Wiley & Sons, argues that the global economy is going through a long period of de-leveraging and weak growth, which makes deflation far more likely and a far greater threat to investors than inflation. Dr. Shilling explains in clear language and compelling logic why the U.S. and world economy will struggle for a number of years and what investors can do to protect and grow their wealth in the difficult times ahead. The investment strategies that worked for last 25 years will not work in the next 10 years. Books can be purchased directly from A. Gary Shilling & Co., Inc. for $20 + 2.77 shipping to U.S. addresses. A counter-point brought by Professor Steve Keen, is he see’s massive deflation ahead. Back in the great depression in the initial years deflation was at times 10% as a massive amount of de-leveraging occurred. His predictions are quite the opposite of what happens when you have unsustainable debt compared to all the other analysts out there. It is said inflation has no correlation to actual money printing, 90% of the money in a currency is NOT printed but loaned into existence, so that alone is a good reason why massive deflation will occur instead of inflation. That money is brought into existence by the banks and will go out of existence there. This completely changes the strategy to hedge against crises. It would seem it would be best to hold money in a currency that stands to deflate as that currency will be worth more, and buy more stuff??? “Morgan Stanley’s chief economist is now betting on a mass default in Europe with a likely recession and/or depression following as a result. Gerard Minack, chief economist at Morgan Stanley, says that there is no historical precedent for countries or continents as indebted as Europe, the US and UK to avoid default, with disastrous results. Japan is often cited as the closest modern example of what will happen once the fiscal crises in the G10 countries unfolds. It is said that Japan is 10 years ahead of where we are. And that Japan is on the edge of a fiscal collapse due to it being unable to finance it debt very soon. Japan has about 1 or 2 years before it starts hitting a brick wall. Europe has started hitting a brick wall but its appears only about 10-15% has hit, the other 85% is to follow shortly. And the US right on its heels. “coordinated debt revaluation”. (source) This is a highly likely scenario, and is already happening with the EU and Greece. The G10 countries all of who are in massive amounts of debt will suffer the most. Developing nations supporting the economies of the G10 will subsequently also suffer although maybe not quite as much. China is a good example of this. The countries who will suffer the least will be countries relatively isolated from the deflationary economies of the developed world. The country that will probably do the best is Brazil due to its isolation. Robust multinational companies will also fare well. Because they have operations all over the world, provided enough are in emerging markets, market share will shift to emerging economies as they cut their losses (aka increase unemployment) in the developed nations. The only developed domestic sectors that will do well will be food. Demand for luxury items and expenses will fall dramatically. There will also always be a certain baseline demand for energy (oil, gas) however demand is unlikely to rise in that sector, if anything it may fall a bit. What banks have the lowest Leverage ratio?